The Overbed Table (6070) has a non-tilt silver vein base and can be raised or lowered to varying positions from 28.25" – 44.75". The walnut wood grained laminate top locks into place when the adjustment handle is released. 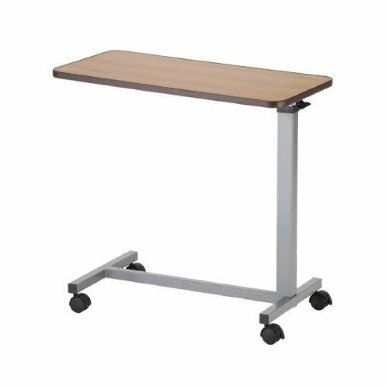 The overbed table has 2 inch locking swivel casters for secure positioning and easy maneuverability. Table measures 30"l x 15"w, base measures 26.25"l x 15.38"w. Weight capacity is 22lbs. Table weighs 24.25lbs.